A few months back I received a complimentary jar of Delwood’s Barbecue Sauce & Marinade courtesy of Delwood Cavenaugh II himself. I told him I’ d write about soon if I liked it. Well, I owe Delwood my sincere apology for taking so danged long to fulfill my commitment. The sauce is excellent and I’ve enjoyed it on several occasions; you readers should buy a jar ASAP to make up for my lack of timeliness in writing this post. Before I get to the sauce, who is this Delwood character? When he initially contacted me, he described himself as “a Browns Summit based Eastern NC style BBQ sauce business with an eye towards whole hog catering, food trucks and eventually a family style restaurant.” I was intrigued already, as Browns Summit is squarely in the middle of Lexington-style barbecue country, yet Delwood was committed to Eastern style sauce and whole hog cooking. Another confused soul? Well, not really, as Delwood was raised in Newport, NC, which is about as far east as one can get in NC without swimming in the ocean. As Delwood writes on his website, “My earliest memories of BBQ are late nights and wood smoke. Newport is ‘The Town With Old Fashioned Courtesy’, but it is best known for the Newport Pig Cooking Contest, the largest whole hog contest in these United States. As such, I grew up surrounded by by Amazing barbecue cooks, steeped in the Eastern North Carolina style, and it was the rare weekend that someone wasn’t cooking up a pig somewhere. As I grew up my dad taught me everything he knew about barbecuing pigs, making sauce… .” Those sound like pretty good Eastern credentials to me. Plus, Delwood is the son of another Delwood, and that ought to count for something. But back to the sauce. I’m generally skeptical of buying NC-style barbecue sauces, since the basic recipe is awfully simple–vinegar, salt, peppers, more ingredients as you wish. 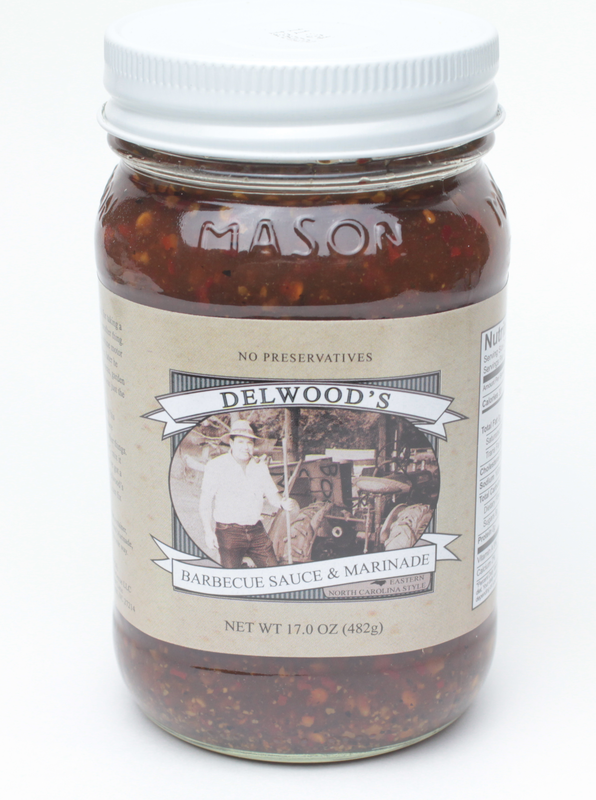 However, Delwood’s sauce is really good and worth the money. It is grounded squarely in the Eastern NC tradition, being that it is tomato-free and has an emphasis on cider vinegar and hot pepper flakes, among other spices, but it has a dollop of brown sugar that ever so slightly mellows out the vinegar tang. I’ve enjoyed the sauce on pork shoulder and chicken, thus far, and the Mason jar and handsome label make it an attractive table sauce. If you can find a sauce purveyor in your area (see the list of where to purchase), I definitely recommend you give it a try. You can even order the sauce from Amazon, although the shipping fee nearly doubles the price. Still, if you’re reading this in some far flung place like New York or California, go for it–heck, you can barely buy a bottle of water for $12 so this is a real bargain. Thanks to Delwood for sharing his sauce with me, and I look forward to ordering my next jar as soon as finish up this one… it surely won’t be long! Chapel Hill, NC – Cackalacky, Inc. announced today that a new Cackalacky® Sweet Cheerwine® Sauce is now available to consumers. The spicy sauce with a note of downhome sweetness was developed in collaboration with Salisbury, NC-based Cheerwine. A unique glaze and marinade that lends itself particularly well to barbecue, chicken wings and grilled morsels, the new product is destined to become an indispensible dipping sauce and tableside condiment. Designed to compliment Cheerwine soft drinks and the bounty of the Southern table, the new blend also serves as the perfect “bookend” to the Cackalacky company’s piquant flagship Spice Sauce. The product comes in 16-ounce jars. While Facebook friends of the two Carolina companies have heard about the product via social media since Nov. 1, the first public roll out of the sauce was hosted at the Cheerwine and The Avett Brothers “Legendary Giveback™ II” Concert in Charleston, S.C. on Nov. 14. Fans attending the benefit concert for three organizations, Operation Homefront, Big Brothers Big Sisters and MUSC Children’s Hospital were able to sample the product prior to the show. The sauce’s next public appearance was held as a part of “A Legendary Thanks! Giving!” food drive & local music event hosted on behalf of the Food Bank of Central & Eastern NC at Fullsteam Brewery in Durham, N.C. on Nov. 16. Cackalacky Sweet Cheerwine Sauce can be found at Harris Teeter stores in the Greensboro, NC area in late November, just in time for the holidays. Look for it in the “Meet Your Local Neighbor” section. The sauce is available nationally at Cackalacky.com. It’s sad but true: Some days I crave barbecue but I don’t have the time to cook it and I’m too lazy to visit the nearest BBQ joint (or, more likely, it is a Sunday and all the good local joints are closed). On these dark days, I have a bright new option: Pig of the Month. The good folks at PigOfTheMonth.com shipped me a sampler pack of meats to test out. In a rare act of generosity on my part, I invited over a few good friends and “cooked” for these semi-pro taste testers. 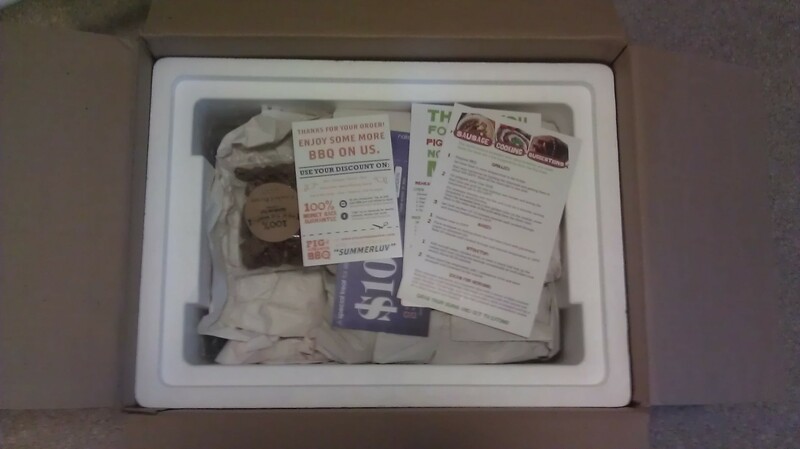 Much to our shared surprise, given our assumptions about mail order meat, we were impressed. The meat ranged from good to excellent, with the sausages and bacon particularly tasty. Our consensus was that the Pig of the Month products tasted fresh and flavorful, were convenient to cook or heat, and could easily hold their own against most restaurant barbecue. -Maplewood Smoked Bacon. Their a medium-thick cut, heavily salted and lightly sweetened bacon, and it is delicious. The bacon is shipped uncooked and frozen. This is not barbecue, of course, but it is pig and I’d eat it daily if it wouldn’t kill me. -Candied Pecans. Their website says it best: “We take organic pecans and roast them with egg whites, sugar, a touch of salt and some special spices to give it a kick at the end. Sweet, crunchy, and a little bit spicy – these nuts will be gone in a jiffy.” No argument from me! -Hot Italian Sausage and Duck, Pear & Port Sausage. Like the bacon, the sausage is shipped uncooked and frozen. 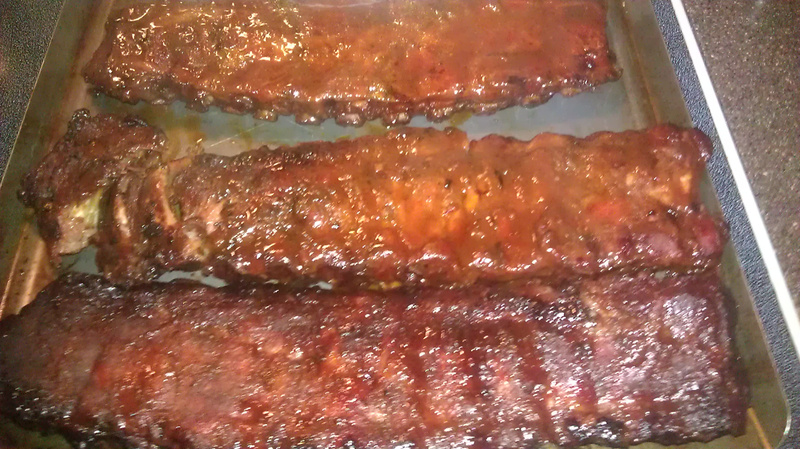 I cooked mine on a gas grill over wood chips to add some smoke flavor. The Italian pork sausage is very good with a gentle heat that does not overwhelm the subtle Italian spicing; fresh taste, excellent texture. However, it was the duck sausage (duck and pork, actually) that had me thinking about mail ordering all my meat–really excellent sausage. -Only selling baby backs is unfortunate, especially when you sell a “Texas -style” rib–you’ll be hard pressed to find a baby back rib at any self-respecting Texas barbecue joint. Hopefully they will add some St. Louis cut ribs or spareribs soon. -I’d prefer the sauce be packed separately instead of cryovaced into the rib, or least put on the rib in lesser quantities. I thought there was simply too much sauce on all three of the ribs I tried. I should note that they do sell a dry rub rib, which is what I’ll order next time, so I can sauce the ribs myself (or not at all). -For a company based in Dayton, Ohio there is a heavy emphasis on phony Southernisms in the marketing and packaging. (E.g, “Y’all come back soon, ya hear.” It’s probably a calculated marketing decision but I found it hokey and forced. Their product is good enough on its own that they can drop the act and admit to being yankees–yankees who produce barbecue good enough to please this southern boy.